Osprey is a one-trick pony. No, not the kind you see in Tijuana; Osprey only makes packs. As a result, they've gotten pretty damn good at it. 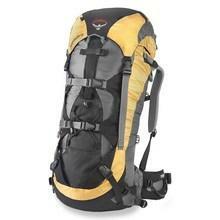 Exhibit A: their flagship Exposure 66 alpine pack. The Exposure has a lot of nice touches, starting with a beautiful balance of capacity (4,000ci for the medium), light weight (just under 4lb) and sublimely comfortable suspension. The top lid floats and has tie-in points for a rope so you can flip your lid without losing your thread. The waist belt has gear loops and is removable and heat-moldable, although just wearing it was enough to form it for my comfort. It also adjusts by pulling forward on two waist straps, rather than sideways on one. You have to try it to realize how nice this seemingly minor feature is. A "shovel wing" stows your snow-thrower, and there are plenty of attachments for skis, ice tools (leashless too) and about anything else you can think of. Osprey's attention to detail shows with one of the few truly practical three-haul-loop configurations I've used on a pack. 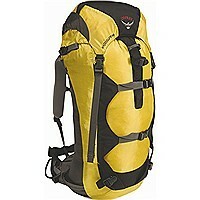 For the money I'd have to put the Exposure at the top of my list for packs in this capacity range.